The Q2Q Comics Vol. 2 Kickstarter is LIVE! 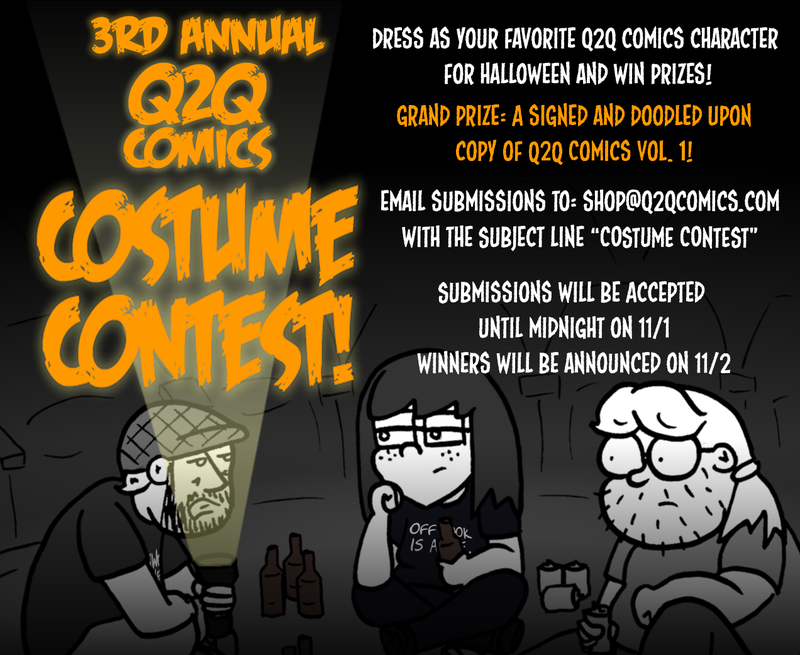 Click here to reserve your copy of Q2Q Comics Vol. 2! The kickstarter campaign for Q2Q Comics Vol. 2 is now live! We’re looking to raise $15,000 to do a first print run hardback featuring comics #221 through #420. The campaign will run from 2/21/18 to 3/24/18. The Vol. 1 campaign was fully funded in 24 hours and raised $40,383 from 1085 backers over 30 days, and we’re expecting an even better turn out for Vol. 2. You’ll be able to get the physical book signed, doodled or plain, single or in pairs, and a digital download of the DRM-free PDF of the book as soon as that becomes available. Everyone who backs the campaign for $5 or more will also get their name in the book! We’re also doing something super special this time around: Department Themed Mystery Boxes. You pick your department (audio, electrics, scenery, stage management, paints, etc.) and we’ll curate a mystery box for you, that could contain, but is not limited to, prints, artwork, hand made things, stuffed animals, clothing, gremlins, stationary, stickers, the true meaning of friendship, buttons, hand written notes, ya know, general loot crate-y stuff. Liz and I have been having a lot of fun brainstorming for this reward tier and I’m super excited to be able to offer it this time. I’ll be posting updates about the campaign here, on Facebook, Twitter, Instagram and Tumblr. If you want to follow more closely, become a patron on Patreon!